This handmade necklace has been constructed by forming and texturing individual silver rings, then linking them together to provide movement. 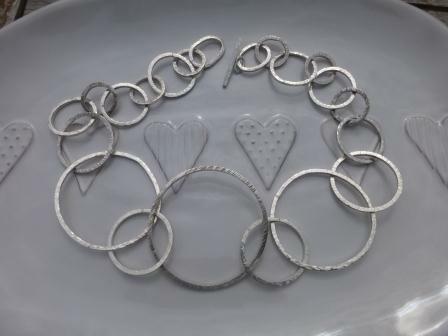 The silver rings range from 6cms diameter to 1.5cm diameter. Each ring has been given a textured finish and then polished to reflect the light. The necklace closes with a handmade T bar. It is hallmarked by the London Assay Office and also bears my sponsors mark. The total length of the necklace is approximately 54cms (21 inches).